"Personalities are like impressionistic paintings. At a distance, each person is 'all of a piece'; up close, each is a bewildering complexity of moods, cognitions, and motives." Exploring the continuum from normal personality traits to the diagnosis and treatment of severe cases of personality disorders, Personality Disorders in Modern Life, Second Edition is unique in its coverage of both important historical figures and contemporary theorists in the field. Its content spans all the major disorders-Antisocial, Avoidant, Depressive, Compulsive, Histrionic, Narcissistic, Paranoid, Schizoid, and Borderline-as well as their many subtypes. Attention to detail and in-depth discussion of the subtleties involved in these debilitating personality disorders make this book an ideal companion to the DSM-IV(TM). Including a new assessment section that singles out behavioral indicators considered to have positive predictive power for the disorders, this Second Edition also includes a special focus on developmental, gender, and cultural issues specific to each disorder. 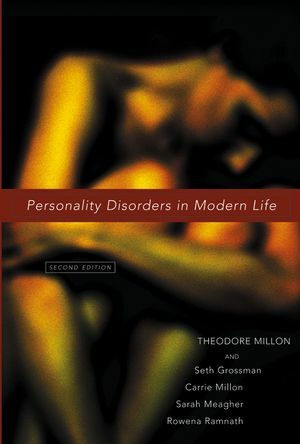 A comprehensive reference suitable for today's practitioners, Personality Disorders in Modern Life, Second Edition features a clear style that also makes it a valuable resource for advanced undergraduate and graduate students. The most thorough book of its kind, this Second Edition is a powerful, practical resource for all trainees and professionals in key mental health fields, such as psychology, social work, and nursing. Theodore Millon, PhD, DSc, is one of the world’s leading authorities on personality disorders. Developer of the widely used Millon personality assessment inventories, he has been the editor of the Journal of Personality Disorders, President of the International Society for the Study of Personality Disorders, and a key member of the DSM-III and DSM-IV committees on personality disorders. Seth Grossman, PsyD, is a codeveloper of several personality inventories, and coauthor of numerous theoretical, research, and clinical papers with Dr. Millon. Carrie Millon, PhD, is former EAP director of the University of Miami and currently Associate Director of the Institute for Advanced Studies of Personology and Psychopathology (IASPP). Sarah Meagher, PhD, is a research clinician practicing health psychology in the behavior medicine programs of Kaiser Permanente mental health services in California. Rowena Ramnath, PsyD, is a research associate at IASPP and specializes in forensic psychology and Internet addiction. Updated to include the latest research in personality disorders. Expanded coverage of gender and cultural implications of the disorders. New sections on assessment in every chapter. New coverage of the developmental issues of Personality Disorders.